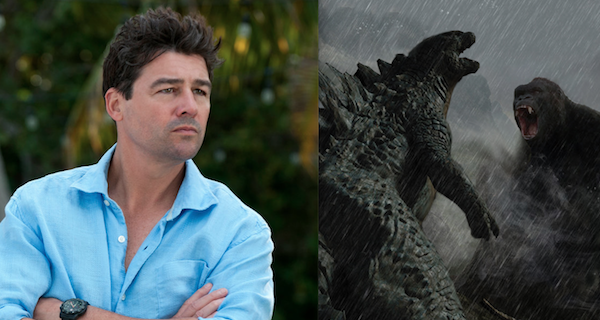 In 2005 Kyle Chandler co-stared in Peter Jackson's successful remake of King Kong, but next year he will go up against another monster 'king' in Michael Dougherty's Godzilla: King of the Monsters. Speaking about the immediate follow up, Chandler was quick to pick a winner. He even reached further back into Godzilla lore, referencing Yoshimitsu Banno's Godzilla vs. Hedorah (1971). "How is King Kong going to beat Godzilla? I don't see it happening! He's got a radiation death ray! ... Godzilla even flies! He can fly! You've seen it!" You can see the full video of Chandler here. He also noted how incredible co-star Millie Bobby Brown was--Recalling a moment during shooting where she recited dialog from another project. "There had to be 30 seconds of dialogue, filled with Latin. It was a full-on adult paragraph that was done eight years ago. She pulled that back in her memory. And she spouted it out. I was blown away." Godzilla: King of the Monsters stars Millie Bobby Brown (Stranger Things), Kyle Chandler (Super 8, Friday Night Lights), Vera Farmiga (The Departed), O'Shea Jackson (Straight Outta Compton), Aisha Hinds (If I Stay), Anthony Ramos (Hamilton), Charles Dance (Game of Thrones), Randy Havens (Stranger Things), Ken Watanabe, (Godzilla), Sally Hawkins (Godzilla), Thomas Middleditch (Silicon Valley), Bradley Whitford (Get Out, West Wing) and Zhang Ziyi (Crouching Tiger, Hidden Dragon). The film will be directed by Michael Dougherty from his screenplay co-written by Zach Shields. Alex Garcia is producing. The film bows March 22nd, 2019. In a campy movie .. yes. In the new version.. no. I'd absolutely, 100% love it if that was a hint that Godzilla flies in the same manner in the next movie. It'd be hilarious to watch how pissy and huffy the "$Er!OU$ F/-nZ" get. Great. We have new member of team Godzilla. I mean, come on, who the heck would wanna be on team KONG? "Godzilla even flies! He can fly! You've seen it!" LOL! Not going to lie, I like Godzilla more, but in this universe based on the 2 movies so far I'm all for Kong. Hopefully G:KOTM changes that. Just make them team up and everyone should be happy and eat monster size cupcakes. Again, it could be like Batman v. Superman: Godzilla could win, and Kong could be in near death, but then a new monster appears, and then they might have to fight it with Mothra (if Legendary lets her survive KOTM and Toho allows them to use her for GvK).